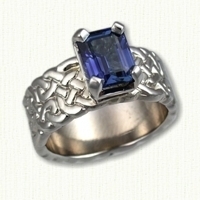 Celtic 'Christa' Engagement Rings: Platinum, Gold and Palladium Engagement Rings by Designet! Description: The 'Christa' engagement ring is an 8mm band style engagement ring. The pattern is the Celtic Double Knot. Bezel setting is at an additional fee. Recommended stone sizes run from .40ct to 1.0ct. 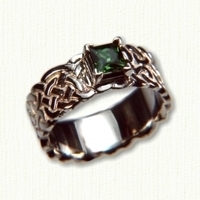 All rings are prong set unless the customer requests a bezel when ordering - bezel setting is extra. Matching Double Knot Wedding Bands sold separately.